If you’re in Beaver Creek, grab a Fat Burger from family-friendly restaurant, The Dusty Boot. Or, if you’re in Vail, order a fresh-from-the-brick-oven pizza at Vendettas. If you’re looking for something a little nicer for dinner, take the kiddos to The 10th in Vail. The kid’s will love the gondola ride up to the mountain-top restaurant, and the whole family will enjoy the great food and even better views. 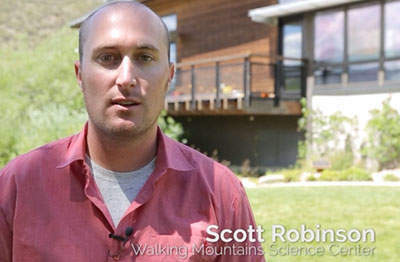 If some of your family members don’t enjoy carving turns on the hill, try snowshoeing or ice-skating. Going to the Spa Anjali, Walking Mountains or VRD Imagination Station is a great way to get out of the cold too. Our biggest suggestion though is Adventure Ridge in Vail. Play in the afternoon and well into the night at Adventure Ridge with ski bikes, kids snowmobile track, tubing lanes and more. When you’ve got a growing family, you learn to love the free stuff! Two of the biggest free activities you should take your kids to are Thursday Night Lights and the Tuesday family snowshoe tours in Beaver Creek. Beaver Creek also hands out free cookies at the base of the mountain everyday at 3pm. 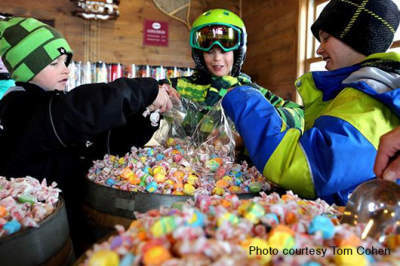 Beaver Creek’s Candy Cabin is located at the top of Strawberry Park Express Lift and Upper Beaver Creek Mountain Express Lift. This cozy cabin will remind you of an old fashioned candy store with bulk candy being sold by the pound alongside custom chocolates and classic Pepsi products with real cane sugar. All ages will enjoy this sweet treat on the mountain! Check out the specially marked “kid zones” on the Vail & Beaver Creek trail maps for guaranteed family fun in specially designed kid areas around the mountains.